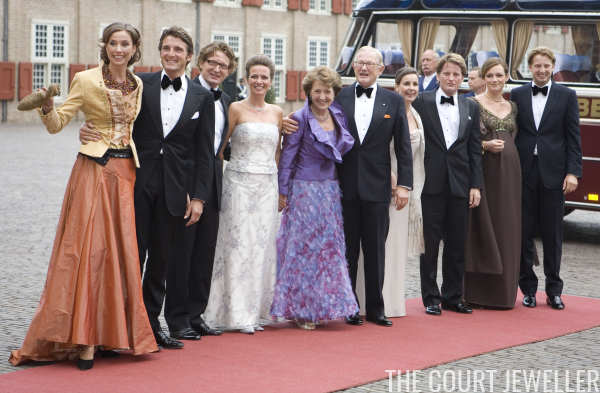 Princess (then Queen) Beatrix's younger sister, Princess Margriet, brought her entire family -- her husband, plus all four of their sons and their spouses -- with her to the party. 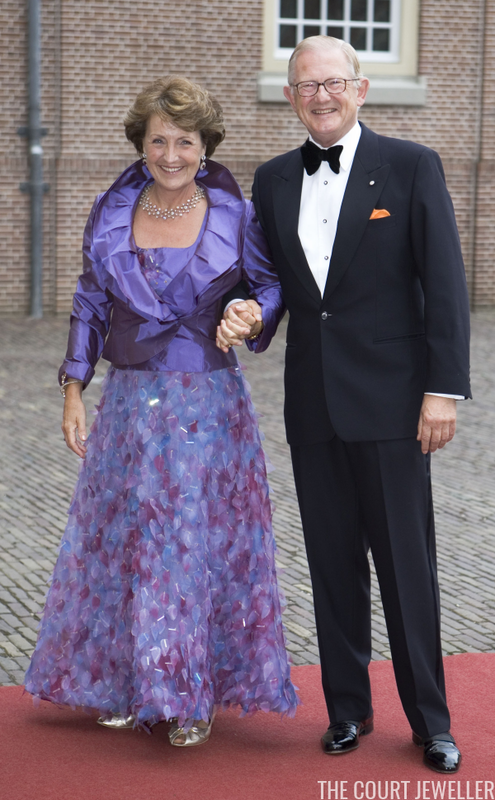 Princess Margriet, who attended with her husband, Pieter van Vollenhoven, wore bright purple for the party. 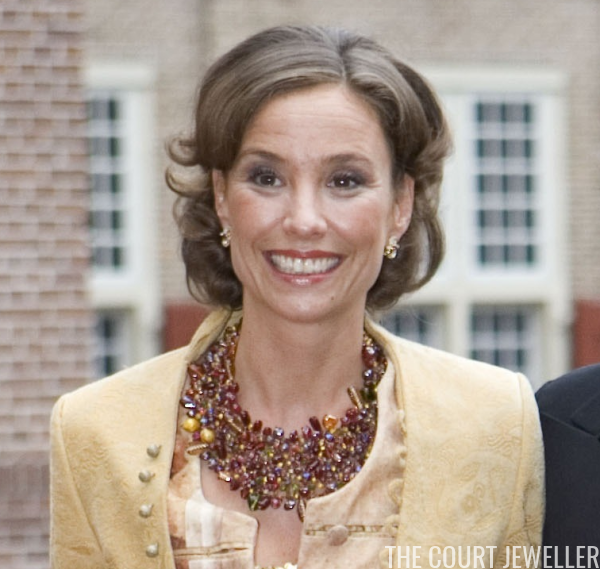 Margriet wore glittering earrings with one of my favorite pieces from the Dutch royal vaults: the Diamond Trellis Necklace. It was made around 1900 for Queen Wilhelmina. She also wore an elaborate wrap bracelet. I think this might be Queen Wilhelmina's diamond and ruby bracelet -- in part because I think the earrings may also be set with rubies -- but I haven't found a conclusive angle, so it could be another piece entirely. 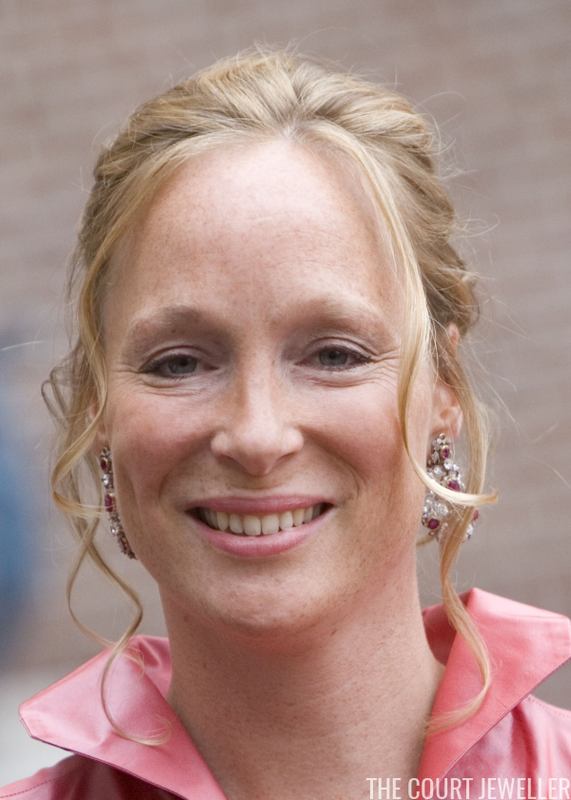 Princess Marilene, wife of Prince Maurits of Orange-Nassau, wore an eclectic mix of clothing and accessories. 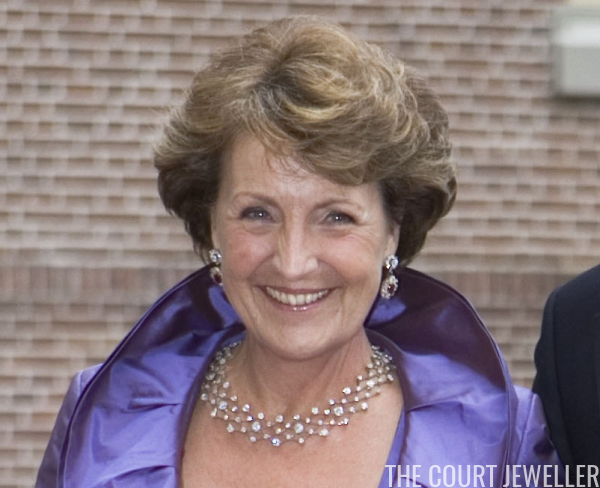 The focal point was her statement bib necklace, which coordinated with her simpler earrings. She also wore a gold bracelet on her right wrist. 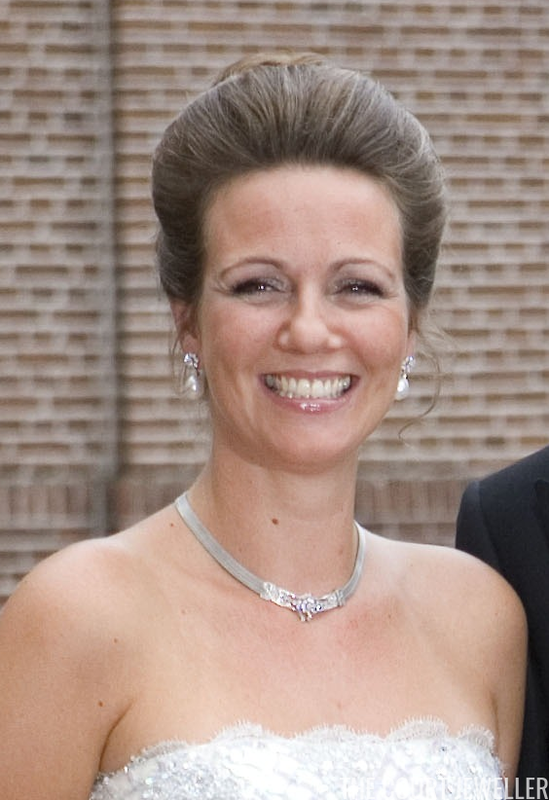 Princess Annette, wife of Prince Bernhard of Orange-Nassau, chose a palette of white and silver for the evening. Her pearl drop earrings and silver-toned necklace coordinated with her gown. 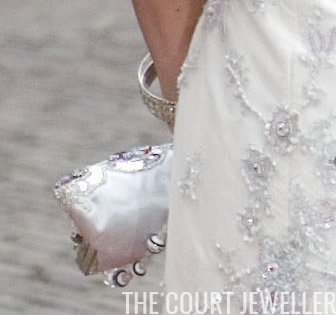 We also got a hint of some glittering bangle bracelets on her wrist. 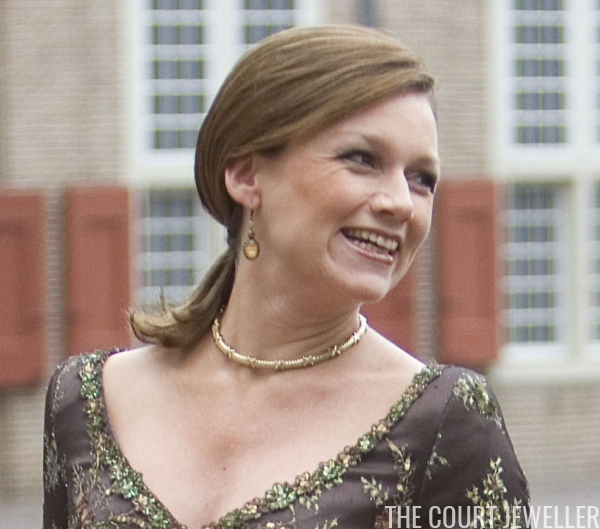 Princess Anita, wife of Prince Pieter-Christiaan of Orange-Nassau, shone in golden jewels. She wore a pair of dazzling chain-link earrings with a textured gold pendant necklace. Her bracelet and ring coordinated with the rest of her jewels. Like Anita, Aimee chose golden jewels for the party. Her earrings are set with an amber-toned gemstone. 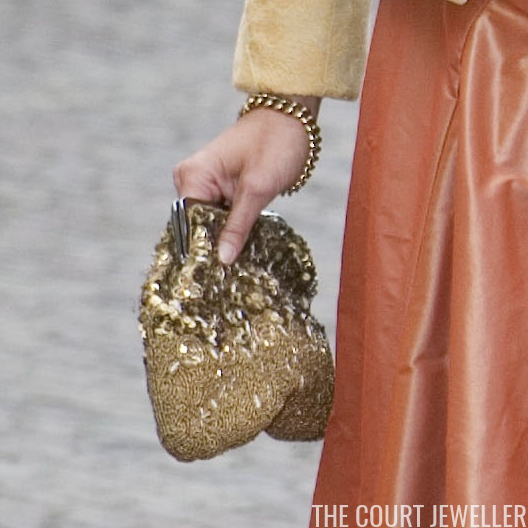 On her right wrist, she wore a major golden statement bracelet. Another golden bracelet, a flexible woven piece, adorned her left wrist; she also wore a gold-toned ring on her left hand. 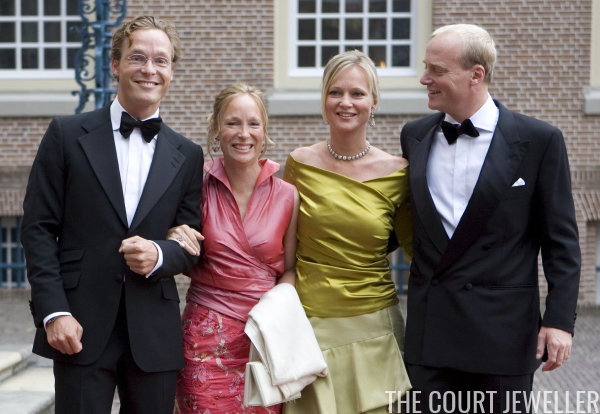 The Bourbon-Parma cousins -- the four children of Willem-Alexander's aunt, Princess Irene -- were also all at the birthday party. Prince Jaime and Prince Carlos escorted their sister, Princess Margarita, to the event. 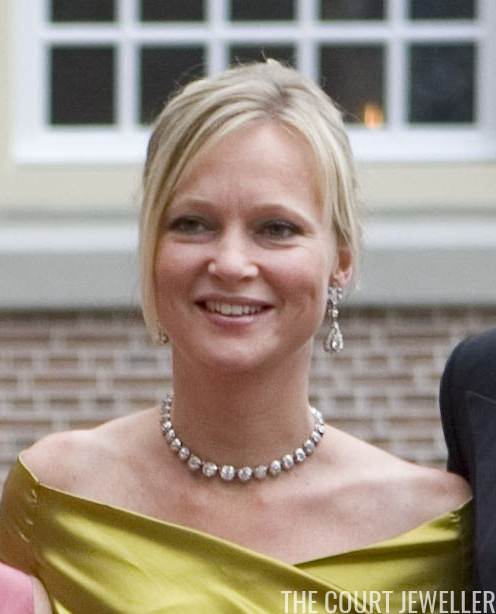 Margarita wore a pair of earrings set with rubies and diamonds. I wish her hairstyle had let us see a bit more of these! 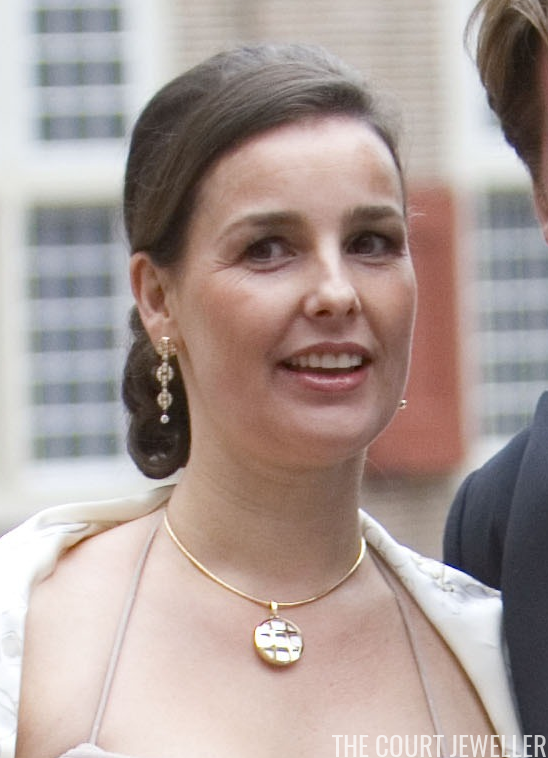 The fourth and youngest sibling, Princess Carolina, was escorted to the party by Queen Maxima's brother, Martin Zorreguieta. She wore a lovely pair of diamond earrings (nineteenth-century, perhaps?) with a diamond necklace. Head back here later today for the third and final installment of this flashback series, featuring the foreign royals who came to the party!